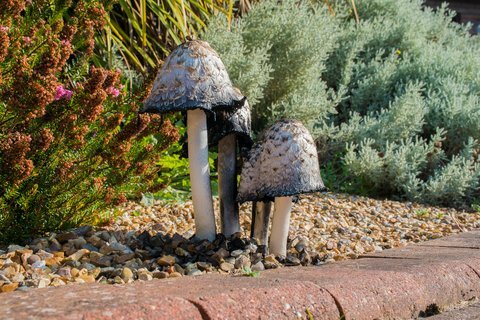 Backyard mushrooms are often called into question by the cautious homeowner, whether for safety of children or pets, or just a sense of general danger that many people have come to associate with wild fungi. But in the spring and summer, several ink cap species will pop up in big clusters, and they are quite the opposite of dangerous. Many are perfectly safe to eat and are highly sought after wild edibles. ALSO READ: Can You Identify These Wild Edible Plants? The term “ink cap” loosely sums up several species of fungus whose mushrooms dissolve into an inky black mess, sometimes hours after emerging from the ground. What the curious uninformed observer would never guess upon seeing a broken-down group of these fungal fruiting bodies is that they are not only edible, but delicious if picked at the right time. First among them is the shaggy mane, or shaggy ink cap. The crown jewel of the inky lawn mushroom world, it is a common occurrence in lawns in springtime. It MUST grow at the base of a dead or dying hardwood. It will never occur on the ground where trees are not present. The shaggy mane must be picked when it is young and not showing signs of breakdown. It is all white, with a cylindrical cap that has a fuzzy texture, which gives it its lesser known name, the lawyer’s wig. As the mushroom develops and the cap opens into more of a bell, blackish staining will appear near where the end of the gills meet the cap, and it will no longer be fit for picking. After picking, it is important to cook the mushroom within a few hours. This does not demand immediate consumption, though. Once sauted, it will hold for a few days in the refrigerator or more if frozen. Important when picking the shaggy mane is to distinguish it from an often confused similar mushroom, the alcohol ink cap, also known as the common ink cap. It is actually an edible mushroom, but its flavor isn’t comparable to that of the shaggy mane. The alcohol ink cap will cause serious gastrointestinal illness, but only if consumed with alcohol. In the past, it was used to treat alcoholics by feeding them the mushroom to deter drinking, and typically one bout of the accompanying sickness would be enough to prevent future abuse. In the case of mixing the disagreeable pair, five to ten minutes after consuming alcohol, facial reddening, nausea and irritation will set in, which will subside over a few hours. It is nothing to be tested though, as instances of heart attack have occurred, and people have experienced the symptoms after consuming alcohol up to three days after eating the mushroom. The alcohol ink cap is never pure white, nor as shaggy as the shaggy mane. The cap is mostly smooth, with vaguely noticeable lines running down the grayish cap. Like the shaggy mane, the gills will start to affect the outward appearance of the cap as they break down and blacken its edges. The cap never has the fully closed structure of the shaggy mane, but rather appears more bell-like even when small. The cap flares out before starting to dissolve. It is generally a much shorter mushroom than the shaggy mane, with its 3-7cm stipe paling in comparison to the shaggy mane’s 10-37 cm stipe. It grows in the same decaying hardwood settings as the shaggy mane. Although it can be consumed, any novice mushroom hunter or casual drinker should just avoid it altogether. 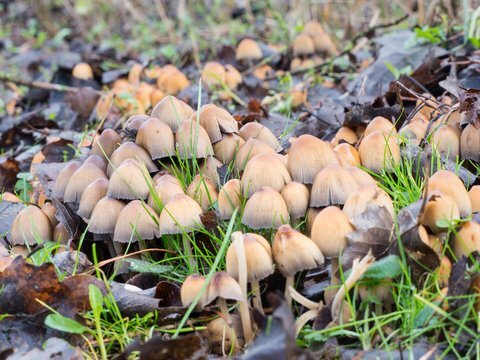 The mica cap is another edible ink cap that is totally safe and boasts a good flavor, though not quite on par with the shaggy mane. The mica cap is easily distinguishable from the alcohol ink cap and shaggy mane because of its tawny brown caps, which have defined radial grooves extending almost to the center. Also the entire surface is usually covered in a dusty, mica-like layer of cells that can create an almost shiny appearance. The contrast of white stipe and brownish cap also helps to distinguish from the other ink caps, which themselves are uniform in color throughout. The mica cap is comparable in size to the alcohol ink cap, but it tends to grow in much larger and more densely clustered groups. In the same fashion as the other ink caps, it grows on dead and decaying hardwood or the ground immediately around it. 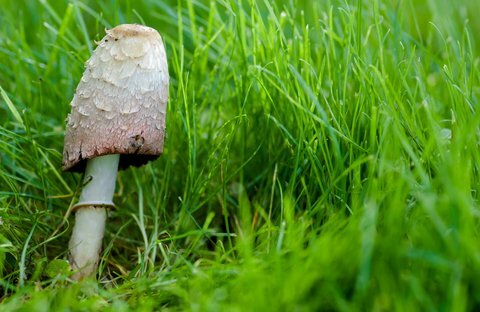 The only real issue that could arise with the mica cap is that its white stipe and brown cap appearance can lump it into a group called LBMs (little brown mushrooms), which can be poisonous, but differentiation between a mica cap and a dangerous mushroom is simple. The mica cap’s fine black gills, with their flimsy texture are a huge distinguishing point. After establishing the gill color and texture, then inspect the cap for its radial lines leading to a darker center, and the fine dusty mica-like cells spread about, though this does wash away on older specimens. 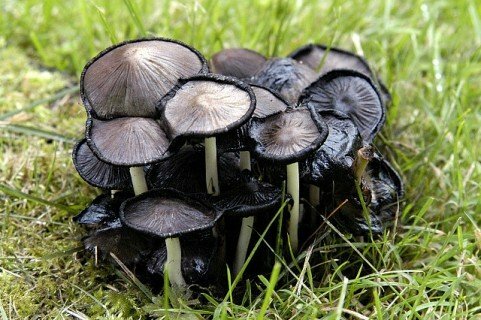 The same rules as the shaggy mane apply to the mica cap in regards to consumption. Either cook and eat it soon after picking, or cook and refrigerate or freeze, but do not store fresh mushrooms. While the mica cap does not boast the same reputation as the shaggy mane, it does come in much larger groups typically, so a single tree will probably provide a bigger meal. Mushroom enthusiasts recommend the mica cap in omelettes. An early morning forage will set the timing just right for a fresh breakfast afterward.